Taken from Dull Roar Patterns: "A little mountain on your head! 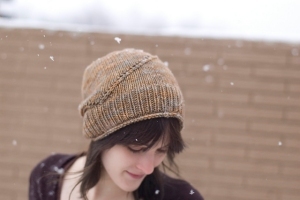 Spiraling lines spice up this easy-to- knit hat, with a rolled hem detail for a touch of extra charm. A great just- past-beginner project or something slightly-more-interesting-than-mindless for the more advanced knitter"
This pattern is from Dull Roar Patterns - Bivouac. Size US 8 - 16" circualr needles, US 8 double point needles (or size needed to obtain gauge), stitch markers, and a tapestry needle are required but not included. Gauge: 19 sts and 28 rows over 4". Color Shown is Earl Grey.